Having graduated from Beijing University of Chinese Medicine in 1988 after six year’s systematic study on Traditional Chinese Medicine (TCM) and Western medicine, he started to work as medical and Chinese medicine doctor in hospital. Mr Wu then gained his Masters medical degree in Dermatology (China’s equivalent of PhD in medicine in Beijing) in 1993. 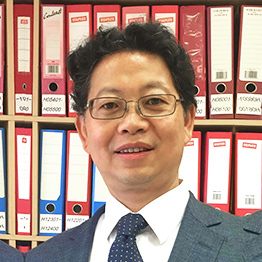 Being one of the best students in his class, Mr Wu started to practise upon graduation in one of the leading teaching hospitals in China during which period he had a few books published and later became a young hospital consultant. In 1995 Mr Wu came to London as a visiting fellow to the London School of Hygiene & Tropical Medicine and University College of London. Soon afterwards he started his TCM therapist career in London. Together with Mr Ma, he set up Acuherbal. With his strong academic and research background and rich clinical experience in his career, he has been able to apply the latest knowledge and the most advanced techniques to treat his patients to the highest standard. He is a good listener and always pays every single attention to his patients, so that he has “touched many hearts”. Mr Wu has expertise in treating Infertility, IVF assistance, Male problems, Menstrual disorders, Skin disorders, Stress, Anxiety and Body Pains.